So today's inspiration isn't for everyone. You will find (I hope) after reading this blog, looking at my work and really get to know me that I don't like traditional. Some things yes, but I love to think outside the box. In fact it excites me. I love to do things a little different but most importantly, I love to do things that I love. I think as a couple you should never compromise your style or wedding details because it isn't traditional or what Great Aunt Bev would want. All that to say I would have LOVED to have a food truck at my wedding. They are fun, laid back and in most cases just so very delicious! You could use a food truck for your main meal, a midnight snack or for dessert! Instead of having your guest pick fish, chicken and beef what if you had multiple food trucks lined up for them to decide?! It would be almost like a food court for your guests! I love the idea of having nice feasting tables al fresco for you to comfortably eat under the stars with your guests. You could also style the area like a picnic with large blankets and matching pillows. Another option, have a dessert truck come after your traditional dinner to deliver ice cream, snow cones or even cupcakes! All of those food vendors exist and they all sound amazing. A popular trend for the last few years has been midnight snacks at a wedding. You have danced all night on the dance floor and you are ready to eat again. Cue food truck for midnight snack. It could be something simple like sliders, grilled cheese, fries, you name it. It is all about presentation, right? So I would definitely get with the food truck company and decide how the food will be presented to your guests. There are a lot of great ways to present the food to match your wedding décor. My favorite websites for amazing packaging ideas is www.ShopSweetLulu.com and www.ThinkGarnish.com I would also suggest a nice sign for the menu in front of the food truck, like a chalkboard so the guests can stylishly see the food options. You could also get custom items made like stickers to label the containers or color coordinating picks, possibilities are endless to make it custom. Locally, there is a group called Jax Truckies that can be found here www.facebook.com/jaxtruckies/info. They will update you on where in the town they are. I recently checked them out and took a few iPhone pics of my experience. If you are looking for a local food truck for your event their Facebook page has a lot of local food trucks listed. What do you think? Would you enjoy this as a guest? 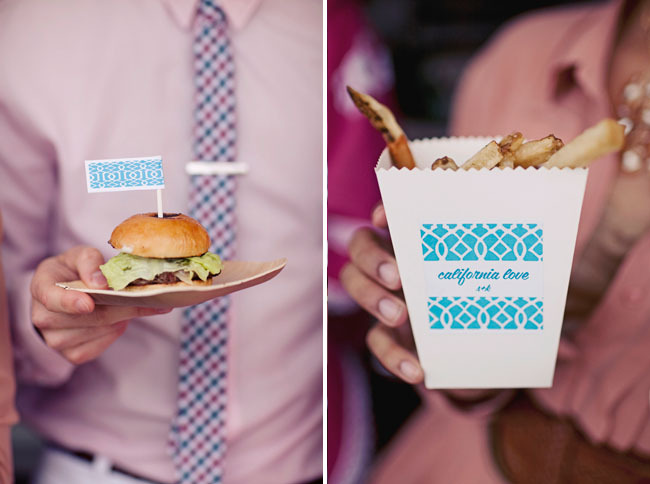 Would you ever have a food truck at your wedding for dinner, dessert or a midnight snack?